Felt Meets Cloth: Workshop Dates - now open for booking! Workshop Dates - now open for booking! Two short 2-hour sessions on Thursday 1st & Friday 2nd August - 10am - 12noon - the first session will cover basic flat wet felting, the second session will cover the basics of dry needle felting. Each session is £12, or if you book both sessions you can get them for just £20. Kids can join in for just £1 (to cover materials) with a paying adult. **Price includes all materials, plus The Corner House are kindly offering one free hot drink! A full day workshop on Saturday 3rd August - 10.30am - 4.30pm - where we will learn the basics of using resists to create seamless felt and go on to experiment with this magical craft, to incorporate various fibres, yarns and materials to create surface texture and decoration. By the end of the day you will have made a seamless felted purse or bowl to take home, and experimented with creating surface texture and design. The day workshop is £35. **Price includes all materials, plus tea & cake, but please bring your own packed lunch as felting can be a hungry business! 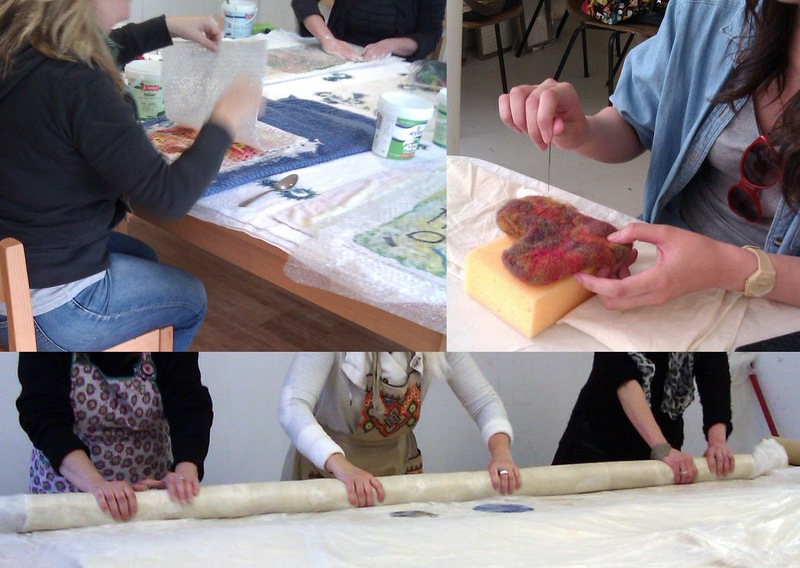 You may also like to bring your own scraps of material, yarns and fibres to experiment with during the workshop. A full day workshop on Saturday 14th September - 10.30am - 4.30pm - In my beginners workshop you will learn about the ancient craft of creating felt from wool fibres in a fun, friendly atmosphere. I will introduce flat wet felting as well as the basics of needle felting as an alternative technique; and by the end of the day you will have created at least one, possibly even two, finished pieces of felt to take home. Price: £35. **Price includes all materials, plus tea & cake, but please bring your own packed lunch as felting can be a hungry business! A full day workshop on Saturday 12th October - 10.00am - 4.30pm - In my experimental workshop you will learn the basics and go on to experiment with this magical craft, to incorporate felt into your work and create wonderful surface patterns and textures for use in a huge range of textile and stitching crafts. Specific skills taught will include: making & using pre-felts; elements of nuno felting techniques with silks & cottons; inclusions of other fibres & materials to create surface textures & design; basics of resist techniques to create surface textures & design. Price: £40. A full day workshop on Saturday 16th November - 10.30am - 4.30pm - In my bowls & potholders workshop you will build on the basic skills of feltmaking to work with resists to create seamless felted forms. By the end of the day you will have either created your very own wet-felted pod bowl or potholder. Price: £40. **Price includes all materials, plus tea & cake, but please bring your own packed lunch as felting can be a hungry business! You may also like to bring your own scraps of cotton cheesecloth or old silk scarves to include in the decoration of your bowl.